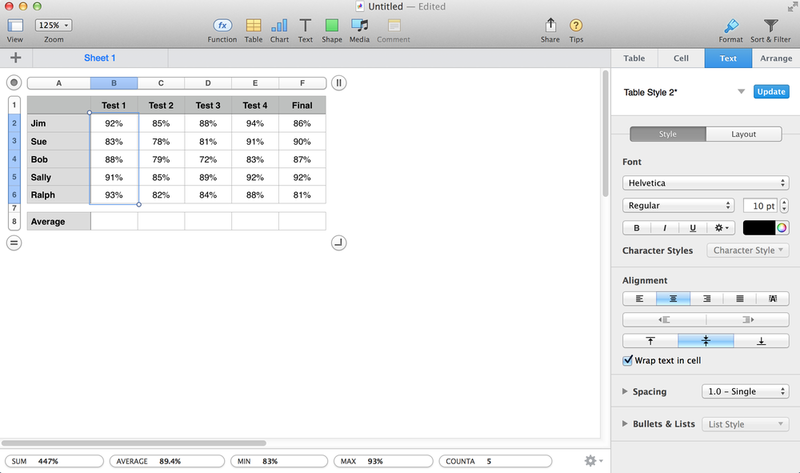 When it comes to making great-looking spreadsheets, Apple's Numbers app does a phenomenal job. Sure, it lacks some of the high-end features of an app like Microsoft Excel, but for the other 95% of us, it's a fantastic spreadsheet app. One of the areas that it does really well in is making quick calculations. In this example, I have a simple spreadsheet to keep track of test scores. I like to do things the easy way, so I will choose option 3. To do this, I will simply highlight the numbers I want to average. With the range of cells selected, you will notice a series of commonly used formulas at the bottom of the screen. Posted on February 21, 2014 by Kevin Allgaier and filed under How To, Design, Mac.